YouTube's new Creative Commons remix feature in its video editor. Making legal YouTube mashups just got a whole lot easier. The site’s video editor is now allowing its users to remix existing YouTube videos without violating anyone’s copyright. This is made possible by YouTube adopting Creative Commons licenses, offering users the chance to publish any video under the liberal CC-BY license. It’s a big step forward for YouTube, and a giant leap for Creative Commons, which previously hasn’t played a big role in the web video world. Here is how the new mashup feature, which is slated to go live at 9 a.m. PDT on Thursday, works: Creative Commons-licensed videos can be found from within YouTube’s video editor through a special CC tab. These videos can then be trimmed, combined with other clips and synchronized to music, just like users have been able to do with their own uploads ever since YouTube launched its video editor a year ago. “It’s as if all the Creative Commons videos were part of your personal library,” explained Product Manager Jason Toff when I talked to him on the phone yesterday. YouTube's new Creative Commons licensing options. YouTube’s catalog of Creative Commons clips is being seeded with more than 10,000 videos from partners like C-SPAN, Voice of America and Al-Jazeera. Users also now have the ability to publish any of their own videos under CC-BY simply by selecting the licenses as an option during the upload process. Toff told me YouTube decided to go with CC-BY to keep the process as simple as possible. “The majority of users will be new to Creative Commons,” he said. CC-BY only requires that users credit the original videographer, and YouTube is automating this process by adding links to the original work next to every mashup video. Toff said that the site might add additional Creative Commons licenses in the future if there was strong demand for it. Two out of three Creative Commons-licensed works can't be reused commercially. Source: Creative Commons. However, there’s another interesting aspect to the choice of license: Creative Commons has in the past been struggling with the fact that the majority of users tends to adopt more restrictive licenses. 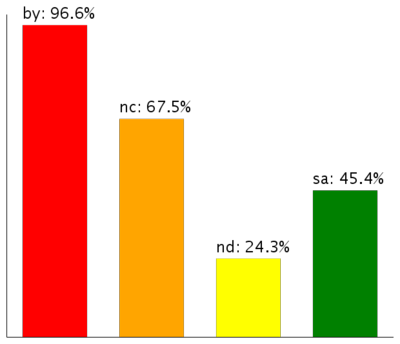 The organization estimated that two out of three Creative Commons-licensed works can’t be reused commercially, and one out of four can’t be reincorporated into a new work at all. CC-BY on the other hand allows commercial reuse as well. This doesn’t just open YouTube and its producers new revenue opportunities it also makes it possible to reuse these videos in a much wider variety of contexts. Wikipedia, for example, demands that any videos posted to its site can be reused commercially. Combine that with the fact that YouTube has been converting its entire catalog into the open source WebM format, and there’s little reason why tens of thousands of Creative Commons-licensed YouTube videos shouldn’t show up on Wikipedia any day now. 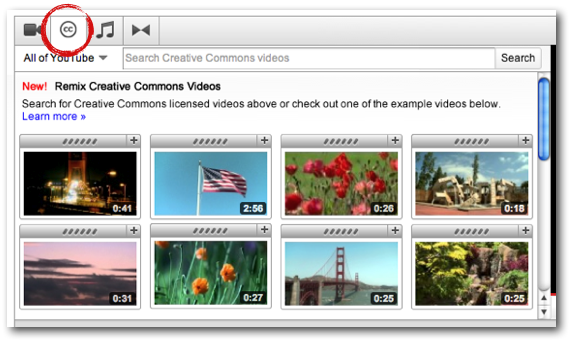 Creative Commons is also poised to benefit greatly from YouTube adopting its licenses. The organization has gotten a lot of traction amongst photographers ever since Flickr added a Creative Commons licensing options as part of its uploading process. Recent Flickr data reveals the site is now hosting close to 190 million Creative Commons-licensed photos. Its licenses haven’t been nearly as popular in the video space, where it has only been adopted by smaller hosting sites and select individual publishers. YouTube’s sheer magnitude could help to make Creative Commons mainstream for video as well. Finally, adopting Creative Commons and making licensed videos instantly remixable is a big deal for YouTube too. The site has shown immense growth, with its users now uploading 48 hours of video very single minute. The next big challenge for YouTube is to grow the percentage of this material that’s monetizeable. The site has been addressing this issue through equipment grants and other programs that aim to help producers to shoot better-looking videos. The new mashup functionality of YouTube’s video editor gives every user a chance to publish videos that look as good as the ones from the pros simply by building upon their works. And who knows, one of these Creative Commons-empowered remix artists may just produce the next Key of Awesome.